This design is available as either a PowerPoint template or a Keynote template. 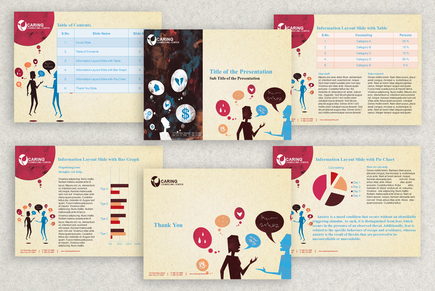 The watercolor and paper texture look of the Personal Counseling PowerPoint presentation template is a perfect way to convey an image of professional advisement. The illustrative elements depict a variety of possible stress-inducers and the relief that comes with speaking to a professional, while the clean type treatment is serious and straightforward.